So browsing 100 Layer Cake, I saw this amazing Fall Harvest Dinner, which looked freaking fabulous and I wondered if anyone would ever put that much effort into decorating their home, much less a Sunday dinner party. 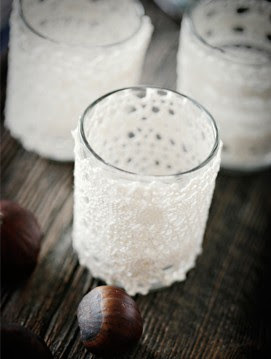 But I HAD to post on the crochet lace ribbon around the votive candles, because I was just talking about how I would like to find some to wrap around the Mason jars. I don't know where I can find that lace, but I love it. Also... The wood board in the middle of the table looks awesome. 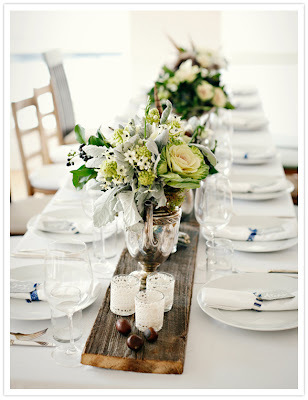 I love the mixing of rustic pieces in with nice white classy items. Next project: Google crochet lace.